I recently got back from a lovely trip to Bermuda. 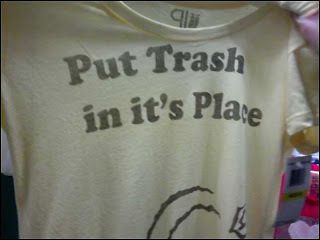 The island features pink-sand beaches, turquoise water, and a refreshing lack of a punctuation errors. And when I did see a few stray apostrophes and unnecessary quotation marks, I didn't really care. That's what being in paradise does to you. You just lie on the beach and ignore the problems of the world (e.g., the mortgage crisis, Rev. Jeremiah Wright, and the Miley Cyrus photo controversy). 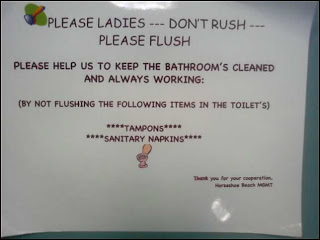 Changing out of my bathing suit after a day at the beach, I saw this sign, and it hardly bothered me. I snapped a quick photo with my camera phone, but my heart wasn't in it. But now I'm back to reality, and I'm sure my snarkiness will return shortly. Reading this sign reminds me of how I felt when Terri Hatcher performed on American Idol this season. This is so atrocious that it has to be a joke, right? 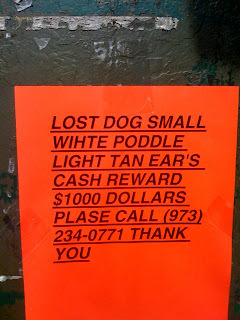 To the person who posted this sign on the corner of 54th Street and 7th Avenue: please tell me you were kidding. Thank you to my friend Michelle for sending me this gem from Manhattan. I'm glad to see she's putting her iPhone to good use. Worst. Sign. Ever! "I'm a bigshot in Boston and I'll have you're [expletive] jobs," Goldklank told the troopers, according to the report. No "[sic]"! Ethan works at an alternative newspaper, and he and his fellow writers and editors were up in arms about this. And I don't blame them. Update: Globe editors have corrected this error on their Web site, but here's a screenshot of the original version. Click on this image to enlarge it, and check out the third paragraph. Update Part 2 (June 13, 2008): Goldklank has resigned from Channel 7. "How could I buy an expensive car from a dealership that doesn't know how to use punctuation correctly?" Anna writes. 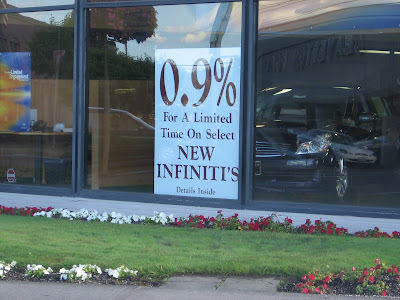 Yes, that's what's keeping me from buying an Infiniti, too. My friend Carrie e-mailed me this photo of a fax that she received yesterday. It was written by "a sales rep who constantly horrifies me with her atrocious grammar and punctuation," Carrie says. "I don't understand why she would even want to emphasize that phrase, nevermind that quotation marks should never be used for emphasis in the first place!" 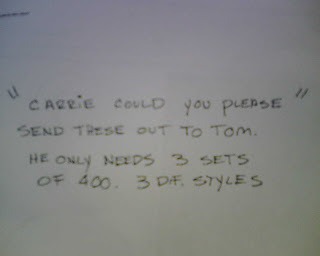 Carrie writes. "It's almost like she's using some kind of colloqiualism like 'mother may I?'" The Metro contains errors every day. But, hey, it's a free newspaper, so I guess you get what you pay for. I sent a particularly egregious error from yesterday to The Grammarphile at Red Pen, Inc.
Is the bill for just one kid? Similarly, I noticed that the bag for Finagle a Bagel advertises kid's meals. 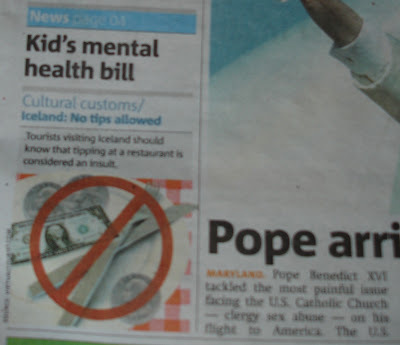 Also, is the slash really necessary after Cultural customs? It looks strange to me. In 1991, Corina sang, "Temptation is a part of life / It doesn't matter if it's wrong or right." 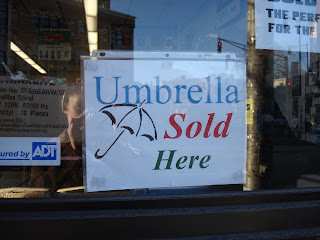 Clearly, the owners of this shop in Downtown Crossing took Corina's advice to heart. They don't care if their punctuation is wrong or right. 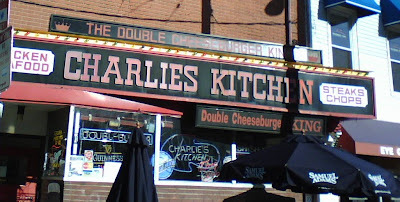 We've got unnecessary quotation marks on the awning and an errant apostrophe in the neon sign. 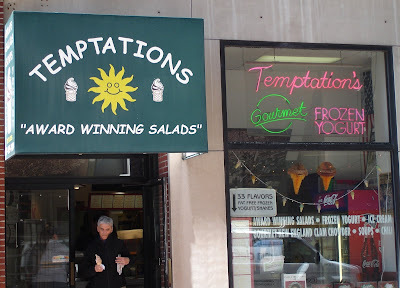 If the name on the awning also contained an apostrophe, one could argue that this take-away was named after someone named Temptation. Um... I don't think so. As you may have guessed from my use of the word take-away in the previous paragraph, I'm a bit of an Anglophile. A couple of my friends sent me a link to this hilarious news story about punctuation from England. Enjoy! Jess came over to my desk yesterday with a giant box of Splenda from our office's kitchen. "Look! It has a punctuation error on it!" she exclaimed. I protested at first. "Noooo, it's fine," I said. 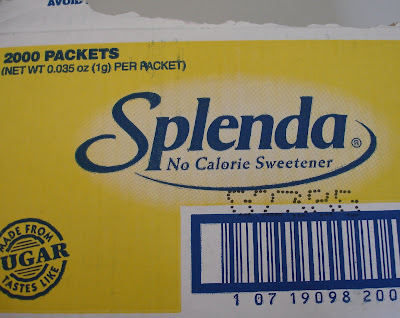 But I then realized that I was letting my love for Splenda cloud my vision. There should be a hyphen between the No and the Calorie since No Calorie is a compound adjective. Alas. 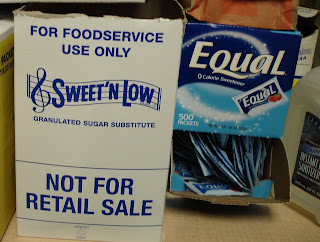 When I went into the kitchen to return the box of Splenda, I noticed that the packaging for Sweet 'N Low (sic) contains an apostrophe catastrophe! When N is used to represent the word and, it should have an apostrophe both before and after. This error is very common. Stay tuned for my entry about the Cask 'n Flagon. One other mistake: Merriam-Webster doesn't recognize foodservice as a real word. If there's one thing I hate more than bad punctuation, it's Fergie. She's horrible in so many ways. Her lyrics are horrendous; she can't sing; and she's not even pretty! So I was thrilled when my friend Katy gave me this collection of hilarious Fergie-themed stickers sponsored by Motorola. Check out the one on the bottom right. It's a little blurry, but I think you'll get the idea. There's an apostrophe after the word I and before the word aint (sic). My friend Carrie also pointed out that the purple sticker on the left misspells the word tasty. I don't know who made these stickers, but it sure ain't an English major! Lets hope the Yankees dont prove that this isnt true. I was going to buy it, but Rihanna got there first. 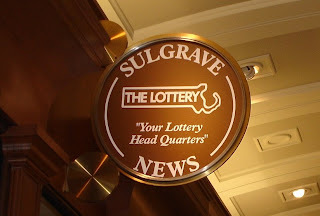 I was shocked to see this sign in a fancy mini-mall between South Station and the Financial District. Perhaps the shop owner is quoting someone who misspelled headquarters? When I first started this blog, I was worried that I wouldn't find enough punctuation errors to sustain it. I still encourage people to write in with their submissions, but I found five punctuation mistakes during a 15-minute walk from South Station to Park Street yesterday. 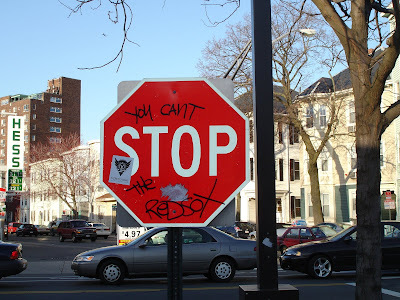 I then found four or five more in and around Fenway Park. The most common error seems to be the misuse of apostrophes. Oh, and no one seems to know how to use en-dashes correctly—especially the Boston Metro. Unnecessary quotation marks are also everywhere you look, as this blog can attest. Adding quotation marks for no reason is not necessarily wrong in many cases. What is wrong, however, is framing words in quotation marks—instead of italicizing or underlining them—for emphasis. Punctuation errors abound on the streets of Boston, but for this entry, I'm staying at home. 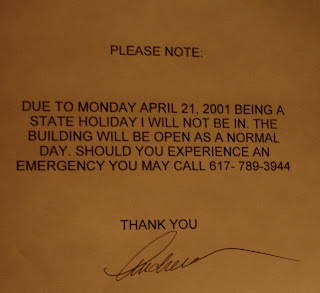 Here's a photo of a sign that my landlords put up in the foyer of our triple-decker. 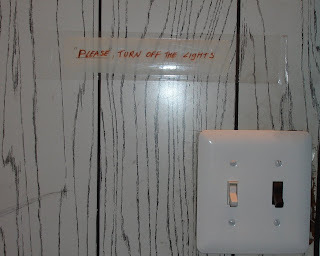 My landlords really really really want us to turn off the lights I guess. They put the word "please" in quotation marks and underlined it. They also put a comma outside of the quotation marks and omitted a period at the end of the sentence for good measure. Ironically, it's impossible to turn off the lights because they are operated by a motion sensor. And don't get me started on the faux-wood paneling. But that's a whole other story. 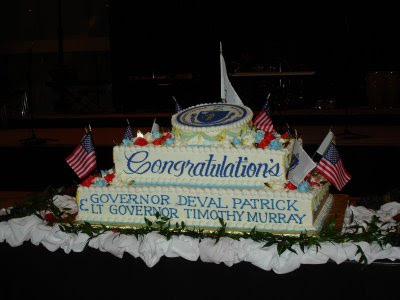 Last January, I volunteered at Massachusetts Governor Deval Patrick's inaugural ball. My heart sank when the caterers wheeled out the cake, which featured a glaring punctuation error. I tried to explain the situation to one of the catering staff people, but she didn't seem to understand my dismay. "You mean it's wrong because it's not plural?" she asked. Eventually, another horrified onlooker removed the offending apostrophe with a plastic knife. Unlike these guys, I don't make a habit of correcting public punctuation errors; I just report on them. Check out this site for more cake catastrophes.